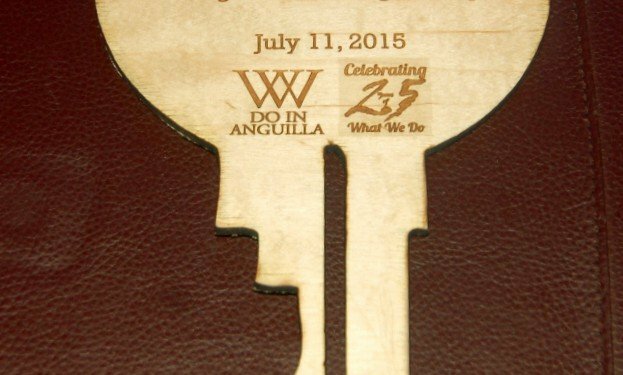 Saturday, July 11, 2015, marked a night of celebration, as What We Do In Anguilla commemorated 25 years of service to the tourism industry and Anguilla during a cocktail and awards ceremony with its advertisers, supporters, contributors, well-wishers and other fellow stakeholders at DaVida Restaurant and Bayside Grill. 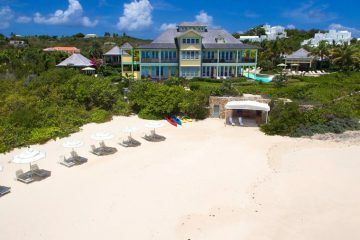 George Hodge – who is respectfully referred to as Teacher George – saw the need to have an island guide (magazine) that would suit one of Anguilla’s top policies- marketing the island as a high-end destination. So, in 1990, he took matters into his own hands and began his efforts to creating such a magazine. 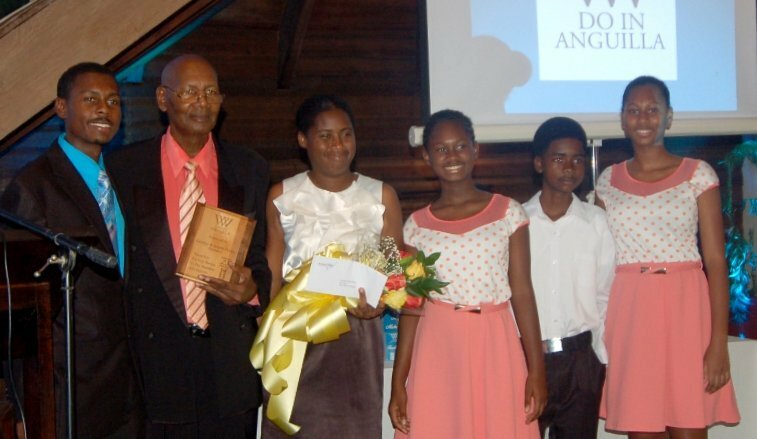 In 1991, What We Do In Anguilla’s first issue was printed. The evening’s proceedings started off with the invocation by the Father Menes Hodge and the national anthem and song on piano by Jahvade Martin. Subsequently, the founder gave a brief history of the magazine and thanked everyone – including former staff members – who helped to ensure continuous publishing of the magazine, while utilizing his sense of humour. 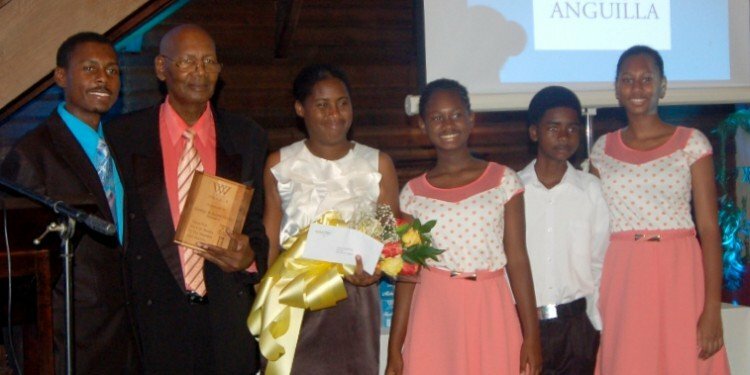 The highlight of his speech, though, was where he officially announced his retirement and said it was “time to pass on the baton” to his son, Clemvio. 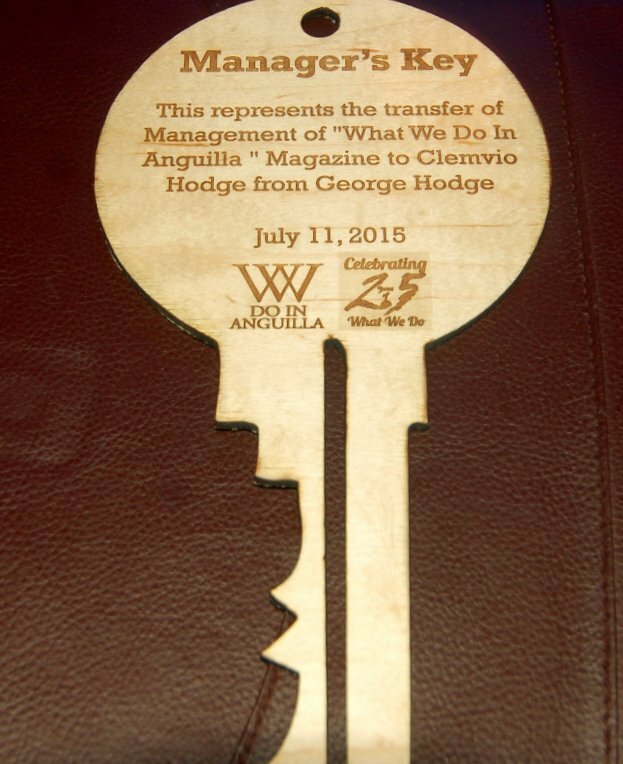 This was demonstrated by the founder handing over to his son a ‘manager’s key’ which symbolized the transfer of management of the magazine. 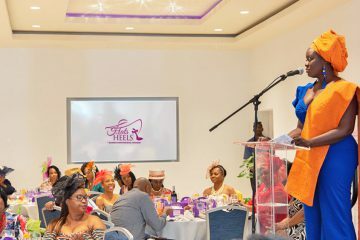 The esteemed host of the event, Shellya Rogers, also, joined in congratulating Clemvio for his unwavering dedication and contributions, to both youth development and culture. Following was a presentation by the declared manager, Clemvio, who highlighted the growing popularity of the magazine using testimonials and statistics and who unveiled his plans for the future of the magazine. He emphasized the great importance of social media to the business world and his aim to increase the presence of the magazine at international events. He showed that, for the past 10 months, he has been able to reach 12,077 persons at one given time on the magazine’s Facebook page. 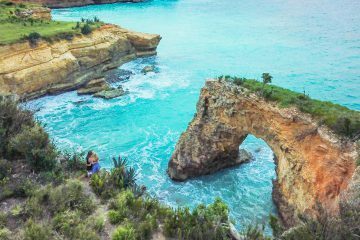 Both the magazine’s Facebook and Twitter pages have been able to reach countries across the world, namely, South Africa, Morocco and United Arab Emirates, just to name a few. 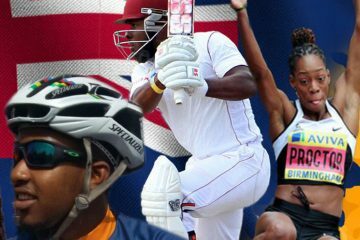 He thought it was the opportune time to officially launch the magazine’s new website which is modern and mobile friendly. Furthermore, this website provides a virtual soft copy of the 2015 issue of the magazine. Moreover, in terms of development, he sees and plans to establish the magazine as “a platform to grow the potential of youth in entrepreneurship, tourism and business skills. Awards were distributed to persons who played an integral part in the creation, growth and continuation of the magazine over the years. 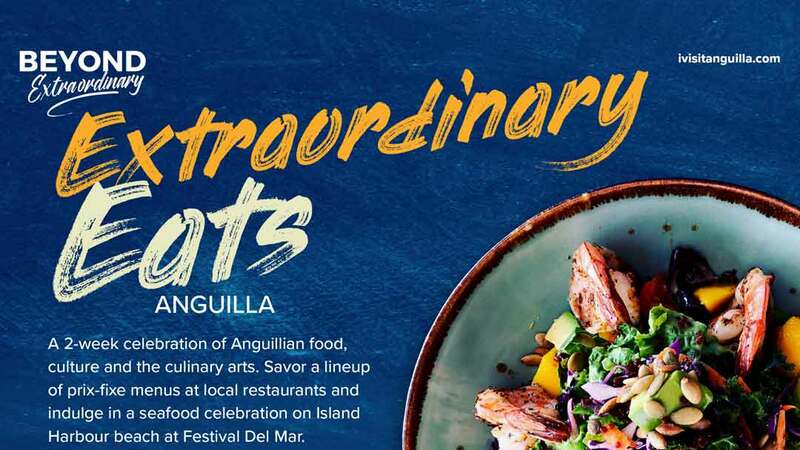 These included Ministers and Junior Ministers of Tourism, Directors of the Anguilla Tourism Board, Chairpersons of the Anguilla Hotel and Tourism Association, layout and design personnel and Lloyd’s Bed & Breakfast, the magazine’s debut and longest advertiser. The event also included door prizes and an auction to raise funds for the DOVE Centre in West End. It ended off with sweet music by the local band Rhythm & Sound and Asha which joined to become quite a dynamic combination. 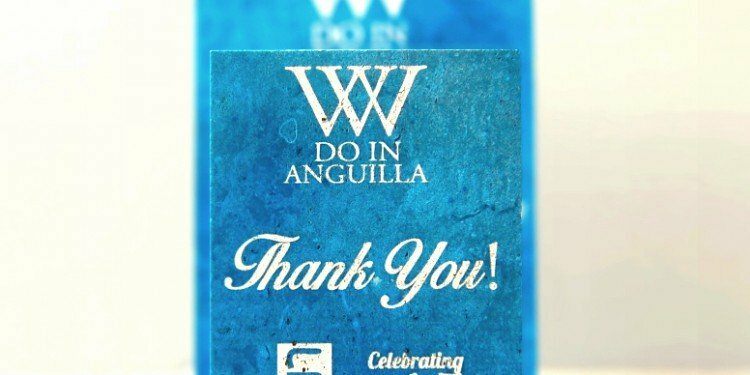 The management and staff of What We Do In Anguilla express sincere gratitude to DaVida for hosting the event, to all their well-wishers, dedicated readers, advertisers, proud sponsors of the event and everyone out there who enjoy What We Do In Anguilla!